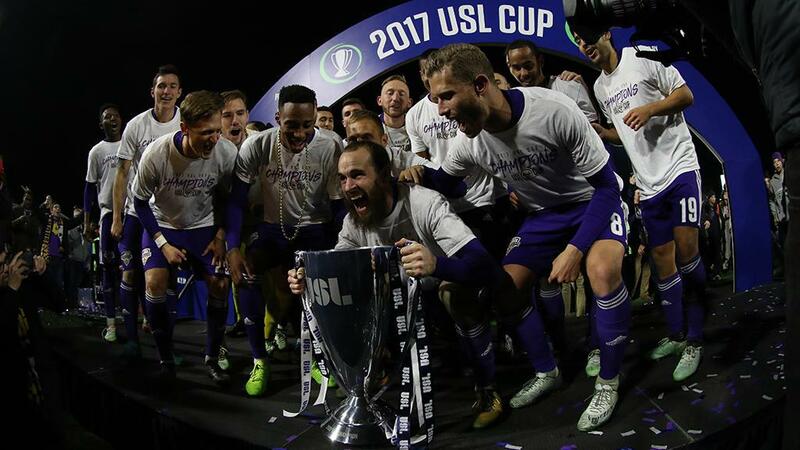 LOUISVILLE, Ky. – Cameron Lancaster’s 88th-minute goal gave host Louisville City FC a 1-0 victory in the 2017 USL Cup against the Swope Park Rangers in front of a sellout crowd of 14,456 at Slugger Field on Monday night. The crowd was a record for Slugger Field and the second highest-attended USL Cup in the league’s history. With the game scoreless entering the final five minutes of regulation, Louisville pushed forward in search of a late winner. Jamaican international Speedy Williams found space on the right and launched a perfectly-placed cross into the center of the penalty area, where Lancaster rose and headed back toward the right corner of the net to send the sellout crowd into massive celebration. The Rangers tried to fight back and find an equalizer and earned a pair of dangerous free kicks in stoppage time, but Louisville’s defense was able to charge down a pair of chances by Nansel Selbol and Max Rugova, while goalkeeper Greg Ranjitsingh punched clear a good delivery by Felipe Hernandez. The host then found a way to hold on and earn its first league championship in just its third season. Louisville had brought early pressure and put the ball in the net in the seventh minute when Paco Craig volleyed home a free kick from 40 yards out, only for the offside flag to be raised. The Rangers had a chance of their own denied for offside too, when a slick passing move through the center almost sprang leading scorer Kharlton Belmar, only for his low finish to be ruled out. The host began to find its passing range more as the first half went on, however, and had much the better of the final 10 minutes before the break. Louisville almost took the lead in first-half stoppage time, when George Davis IV nutmegged his marker in the left corner and broke into the penalty area, but his chipped cross was too high for Brian Ownby to turn on target as the game went to the break scoreless. Swope Park came out aggressively to start the second half, and Louisville goalkeeper Greg Ranjitsingh had to be sharp to come off his line and deny Belmar as he broke toward the through-ball just inside the penalty area. The Rangers also threatened just past the hour-mark, as Colton Storm found space in the right side of the penalty area but couldn’t pick out a teammate with his low cross. The Rangers continued to press forward as both teams made moves in search of a winner, and Lebo Moloto’s well-hit shot from 20 yards was smothered by Ranjitsingh with 16 minutes to go. But Louisville’s late strike by Lancaster carried the day for City, bringing a memorable night at Slugger Field to a rousing finish. Man of the Match – Paolo DelPiccolo, Louisville City FC: DelPiccolo put in a captain’s performance in the center of midfield for the hosts, breaking up play and creating chances as Louisville claimed the USL Cup.